If you have any information about these crimes, or any criminal activity, you are urged to call Crime Stoppers at 1-800-222-8477 or submit a Web Tip . You do not have to give your name. CRIME STOPPERS will pay a cash reward of up to $2000 and you can remain anonymous. For other unsolved crimes, look under the "Unsolved Crimes" tab. 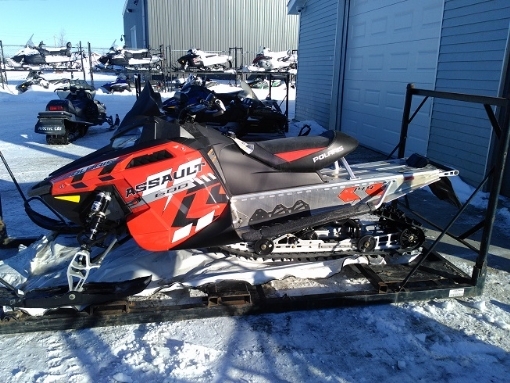 The Holyrood RCMP is seeking the public’s assistance in solving the theft of a Side by Side. Sometime between the evening of Thursday, January 18, 2018 and 11:00 a.m. on Sunday, January 21, 2018, a blue 2013 Polaris Razer Side by Side with NL Plate # VFR 793 was stolen from a shed on Woodford Station Road in Holyrood. Anyone with information about this incident is asked to contact the Holyrood RCMP at 709-229-3892. Residents who wish to remain anonymous can contact Crime Stoppers toll free at 1-800-222-TIPS (8477), by Secure Web Tips at the link below or by texting TIP190 and your message to CRIMES, which is 274637. Electronic tips submitted to Crime Stoppers are encrypted, entirely confidential and completely anonymous. You may be eligible for a cash reward. The Glovertown RCMP is seeking the public’s assistance is solving a break and enter in Terra Nova National Park. Sometime between the evening of Monday, December 5, 2017 and the morning of Tuesday, December 6, 2017, someone entered a construction site just past the Splash and Putt on the Trans Canada Highway. Culprits broke into a mobile trailer on site and stole a generator and numerous tools. If you know anything about this crime, please contact the Glovertown RCMP at 709-533-2828. If you wish to remain anonymous you can contact Crime Stoppers by calling 1-800-222-TIPS (TIPS is 8477), by Secure Web Tips at the link below, or by texting TIP190 and your message to CRIMES, which is 274637. Electronic tips submitted to Crime Stoppers are encrypted, entirely confidential and completely anonymous. You may be eligible for a cash reward. 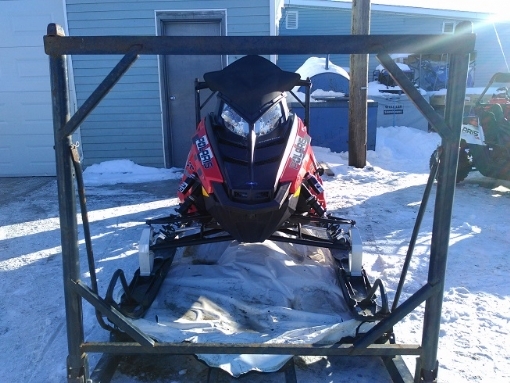 The Happy Valley-Goose Bay RCMP is seeking the public’s assistance in solving an incident of theft. On Wednesday, December 21, 2017, a resident took their skidoo out for a ride and it broke down. They dragged the skidoo off the trail near Upper Portage near Welbourne Bay. Upon returning to the site the next day, it was discovered that it had been stolen. 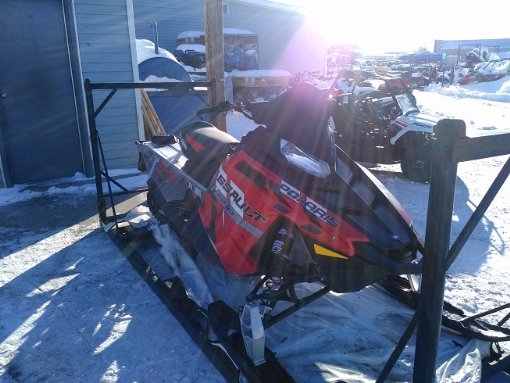 The skidoo is a 2016 black and red Polaris Assault 600 Switchback. If you know anything about this crime or can identify this person, please contact the Happy Valley-Goose Bay RCMP at 709-896-3383. If you wish to remain anonymous you can contact Crime Stoppers by calling 1-800-222-TIPS (TIPS is 8477), by Secure Web Tips at the link below, or by texting TIP190 and your message to CRIMES, which is 274637. Electronic tips submitted to Crime Stoppers are encrypted, entirely confidential and completely anonymous. You may be eligible for a cash reward. The RCMP in Flower’s Cove is seeking the publics assistance in solving a break and enter at PharmaChoice. In the early evening hours of January 27, 2017, someone broke into the PharmaChoice pharmacy in Flower’s Cove and a large amount of prescription pain medication in various forms was stolen. The thief made entry into the building by cutting a hole in the wall to gain access into the pharmacy. If you know anything about this crime, please contact the Flower’s Cove RCMP at 709-456-2500. If you wish to remain anonymous you can contact Crime Stoppers by calling 1-800-222-TIPS (TIPS is 8477), by Secure Web Tips at the link below, and by texting TIP190 and your message to CRIMES, which is 274637. Electronic tips submitted to Crime Stoppers are encrypted, entirely confidential and completely anonymous. You may be eligible for a cash reward. The Gander RCMP are seeking the public’s assistance in identifying the person responsible for an armed robbery at the A&W restaurant on the Trans Canada Highway on Monday, January 16, 2017. At approximately 10:30 p.m. a masked individual confronted a worker as she was closing for the night. The suspect was armed with what is believed to be a knife and demanded money. The suspect fled the scene with an undisclosed amount of cash. The unknown male was wearing a white hoodie with a blue vest over it. The hood was up and the males face was covered. The male was wearing gloves and dark coloured pants. He is described as being slim, 6-6’2 feet tall with a deep voice and blue eyes. If you know anything about this crime, please contact the Gander RCMP at 709-256-6841. If you wish to remain anonymous you can contact Crime Stoppers by calling 1-800-222-TIPS (TIPS is 8477), by Secure Web Tips at the link below or by texting TIP190 and your message to CRIMES, which is 274637. Electronic tips submitted to Crime Stoppers are encrypted, entirely confidential and completely anonymous. You may be eligible for a cash reward. The New Wes Valley RCMP is seeking the public`s assistance in solving a vehicle theft. Sometime between the hours of 6:30 pm on Saturday, November 25th and 9:00 am on Sunday, November 26th, a 2017 white 4 door pickup truck was stolen from the old Greenspond Highway. It was located on the wharf at Beothic Fish Processors in Valleyfield, NL hooked to a guide wire of light pole with significant damage. The New Wes Valley RCMP is seeking the publics assistance in solving a vehicle theft in Centerville. Sometime between the hours of 5:30 pm on Friday, November 10, 2017 and 9:30 am on Saturday, November 11th, a 2002 blue Honda Civic with silver side mirrors was stolen from a private driveway in Centreville, NL. The vehicle was located on November 11th on an old dirt highway, locally known as Old Jingle. The vehicle was completely destroyed by fire. The Ferryland RCMP is seeking the public’s assistance in solving a break and enter in Mobile. If you know anything about this crime, please contact the Ferryland RCMP at 709-432-2440. If you wish to remain anonymous you can contact Crime Stoppers by calling 1-800-222-TIPS (TIPS is 8477), by Secure Web Tips at the link below, or by texting TIP190 and your message to CRIMES, which is 274637. Electronic tips submitted to Crime Stoppers are encrypted, entirely confidential and completely anonymous. You may be eligible for a cash reward. The RCMP are investigating a break and enter at residence in Marystown. On November 3, 2017 at approximately 9:30 p.m., Marystown RCMP responded to a complaint of a break and enter in the community. A man with a knife entered a house on Greenwood Street in Marystown. The suspect quickly fled when a resident of the home appeared. The suspect is described as approximately 6 feet tall and was wearing a black mask, dark hoodie, black pants and gloves. The RCMP Police Dog Services Unit aided with a search of the area. Anyone with any information concerning this crime is ask to contact Marystown RCMP at 709-279-3001. To remain anonymous contact Crime Stoppers toll free at 1-800-222-TIPS (8477), text TIP190 + your message to "CRIMES" (274637), or by webtip at the link below. Electronic tips submitted to Crime Stoppers are encrypted, entirely confidential and completely anonymous. You may be eligible for a cash reward. The Royal Newfoundland Constabulary is investigating a suspicious vehicle fire in the area of the RCAF Rd, off Torbay Rd. St. John’s (Airport) that occurred sometime in the early morning of Sunday, October 8, 2017. Investigators determined the vehicle, a 2014 Honda Civic, was stolen from the apartment complex off Penney Lane and Torbay Rd. The investigation is ongoing. Anyone with information on this incident is asked to contact the RNC at 729-8000. If you wish to remain anonymous you can contact Crime Stoppers by calling 1-800-222-TIPS (TIPS is 8477), by Secure Web Tips at the link below, or by texting TIP190 and your message to CRIMES, which is 274637. Electronic tips submitted to Crime Stoppers are encrypted, entirely confidential and completely anonymous. You may be eligible for a cash reward. The Ferryland RCMP is seeking the public’s assistance is solving a residential break and enter in Bay Bulls. Sometime midday on October 6, 2017, someone entered a home on the main road in Bay Bulls by breaking the glass in the door. Two jewellery boxes were stolen and a large quantity of jewellery. The Deer Lake RCMP is seeking the public’s assistance is solving a break and enter in Deer Lake. If you know anything about this crime, please contact the Deer Lake RCMP at 709-635-2173. If you wish to remain anonymous you can contact Crime Stoppers by calling 1-800-222-TIPS (TIPS is 8477), by Secure Web Tips at the link below , and by texting TIP190 and your message to CRIMES, which is 274637. Electronic tips submitted to Crime Stoppers are encrypted, entirely confidential and completely anonymous. You may be eligible for a cash reward. The Port aux Basques RCMP is seeking the public’s assistance is solving a break and enter in Cape Ray. Sometime between September 17th, 2017 and September 19th, 2017, someone broke into a construction trailer parked in the Cape Ray area and stole several items from the trailer. Anyone with information in relation to this theft is asked to contact Channel-Port aux Basques RCMP at (709) 695-2149. If you wish to remain anonymous you can contact Crime Stoppers by calling 1-800-222-TIPS (TIPS is 8477), by Secure Web Tips at www.nlcrimestoppers.com , and by texting TIP190 and your message to CRIMES, which is 274637. Electronic tips submitted to Crime Stoppers are encrypted, entirely confidential and completely anonymous. You may be eligible for a cash reward. The Glovertown RCMP is seeking the public’s assistance is solving a recent arson which took place in the Hare Bay Municipal Park. Sometime during the night of September 04, 2017 a truck bed camper in the Hare Bay Municipal Park was destroyed by fire. At this time, it is not known how many people were involved. If you have any information regarding this crime, please contact the Glovertown RCMP Detachment at (709) 533-2828. If you wish to remain anonymous you can contact Crime Stoppers toll free at 1-800-222-TIPS (8477), text TIP190 + your message to ‘CRIMES" (274637), or by Secure Web Tips at the link below. Electronic tips submitted to Crime Stoppers are entirely confidential. You may be eligible for a cash reward. The Gander RCMP is seeking the public’s assistance in solving a vehicle theft. Sometime on August 4, 2017, a beige 4 door Dodge Ram 1500 was stolen from a residence on Sullivan Street in Gander. The truck has a plow mount on the front, chrome running boards under the doors and a beige matching cap over the box of the truck. It also has beige fender flares. The truck was later located outside of the Anglican Church in Gander. The police are attempting to locate the person responsible. If you know anything about this crime , please contact the Gander RCMP at 709-256-6841. If you wish to remain anonymous you can contact Crime Stoppers by calling 1-800-222-TIPS (TIPS is 8477), by Secure Web Tips at the link below or by texting TIP190 and your message to CRIMES, which is 274637. Electronic tips submitted to Crime Stoppers are encrypted, entirely confidential and completely anonymous. You may be eligible for a cash reward. The Whitbourne RCMP is seeking the public’s assistance in solving theft of a vehicle in Chapel Arm. Sometime between Friday, September 1, 2017 and Tuesday, September 5, 2017, a vehicle was stolen from residence located in Chapel Arm, NL. The owners were away for the weekend and upon returning discovered that their car was missing. 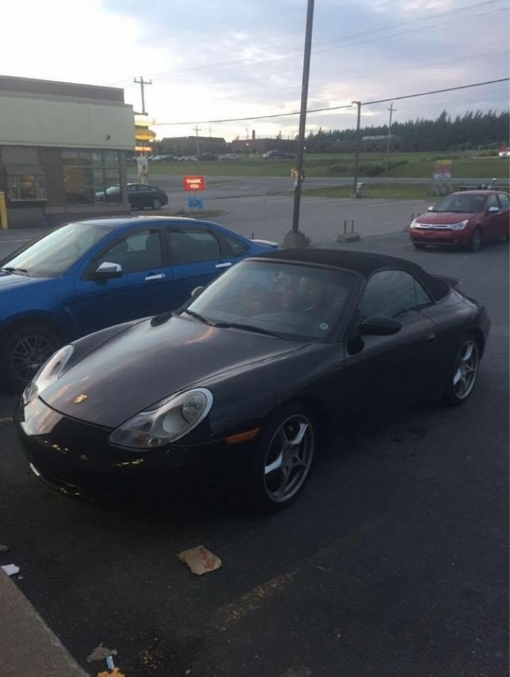 The vehicle is a black 2001 Porsche Carrera 911 two door convertible with NL plate HPO 891. If you know anything about this crime, please contact the Whitbourne RCMP at 709-759-2600. If you wish to remain anonymous you can contact Crime Stoppers by calling 1-800-222-TIPS (TIPS is 8477), by Secure Web Tips at the link below, or by texting TIP190 and your message to CRIMES, which is 274637. Electronic tips submitted to Crime Stoppers are encrypted, entirely confidential and completely anonymous. You may be eligible for a cash reward. The RCMP in Nain is seeking the public’s assistance in obtaining information about a house fire. In the early morning hours of August 13th, 2017, the residents at 8 Ukalik Street were awakened by their neighbours when a fire was observed at their back door. All persons escaped through the front door of their home while the fire had continued to spread into the attic of the home. The fire department was able to extinguish the fire, although considerable damage had been done to the home. The fire is deemed suspicious. If you know anything about this crime, please contact the Nain RCMP at 709-922-2862. If you wish to remain anonymous you can contact Crime Stoppers by calling 1-800-222-TIPS (TIPS is 8477), by Secure Web Tips at the link below, or by texting TIP190 and your message to CRIMES, which is 274637. Electronic tips submitted to Crime Stoppers are encrypted, entirely confidential and completely anonymous. You may be eligible for a cash reward. 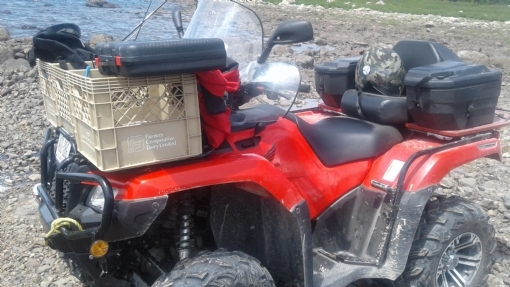 The Ferryland RCMP is seeking the public’s assistance in solving a theft of an ATV in Mobile. Sometime between midnight on Wednesday, August 16, 2017 and 3:00 p.m. the following day, an ATV was stolen from a residents shed in Mobile. The ATV was a red Honda Rubicon with a dual transmission and approximately 500 kms. The license plate # is VGO 086; VIN # is 1HFTE4643G4101199. The Holyrood RCMP is seeking the public’s assistance in solving a break and enter in Holyrood. If you know anything about this crime, please contact the Holyrood RCMP at 709-229-3892. If you wish to remain anonymous you can contact Crime Stoppers by calling 1-800-222-TIPS (TIPS is 8477), by Secure Web Tips at the link below, or by texting TIP190 and your message to CRIMES, which is 274637. Electronic tips submitted to Crime Stoppers are encrypted, entirely confidential and completely anonymous. You may be eligible for a cash reward. The Ferryland RCMP is seeking the public’s assistance in solving two cabin break and enters on Birch Hill Path off of Horse Chops Road in Cape Broyle. On the night of Friday, July 28, 2017, the RCMP received a call from a resident reporting suspicious activity at two cabins in Birch Hill Path. A white vehicle, possibly a Honda Civic or a Chrysler PT Cruiser, was parked in the driveway of one of the cabins. When the male, in his 30’s, was questioned as to why he was there, the male got in the vehicle and drove away. It was later learned that two televisions, a 39” Hitachi and a 47” LG, both black in colour, were stolen as well as a green Poulan chainsaw which was still in the box. Another male in his 30’s is believed to be involved. There are no further descriptors for the suspects.